Some big things are in store for exhibitors using Warner’s Features. Down in Austin Texas, the Satex Film Co. is turning out some wonderful three-reel productions, featuring Miss Martha Russell, formerly Essanay’s leading lady. The first picture, “Their Lives by a Thread,” has been confiscated by the Mexican Government because it contained some striking scenes taken across the border in which real untamed Mexicans are shown attacking Americans. But the second release [“Mexican Conspiracy out Generaled”], more thrilling than the first is on its way North, and will be ready for booking this month. Lovers of the sensational will find in “Their Lives by a Thread,” a three-reel Warner’s Feature, some startling incidents. Martha Russell, as the daughter of a prosperous American living in Mexico, who has defrauded his life insurance company out of $100,000 by a fiendish plot, falls in love with the president of the insurance company and saves him from death at the bottom of a deep excavation. 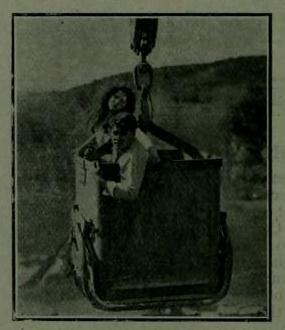 To accomplish this, she climbs inside an ore-bucket and with a Mexican girl at the throttle of the hoisting engine, is carried five hundred feet in the air, then lowered to the spot where her admirer has been thrown by half-crazed strikers who believe him to be a strike-breaking leader. Miss Russell is supported by Robert Kelly, leading man of the Satex Film Co., of Austin, Texas. En Their Lives by a Thread (1913), unos norteamericanos eran atacados en la frontera por “salvajes mexicanos verdaderos”, según The Moving Picture World (22 de marzo de 1913); se decía en la nota dedicada por la revista a esa película que Their Lives by a Thread fue confiscada por el gobierno mexicano, pues varias de sus escenas habían sido filmadas indebidamente en México. Ficha filmográfica de Their Life by a Thread. También conocida bajo el título de Their Lives by a Slender Thread. (1913) Norteamericana. B&N: Tres rollos. Drama. Producción: Satex Film Company. 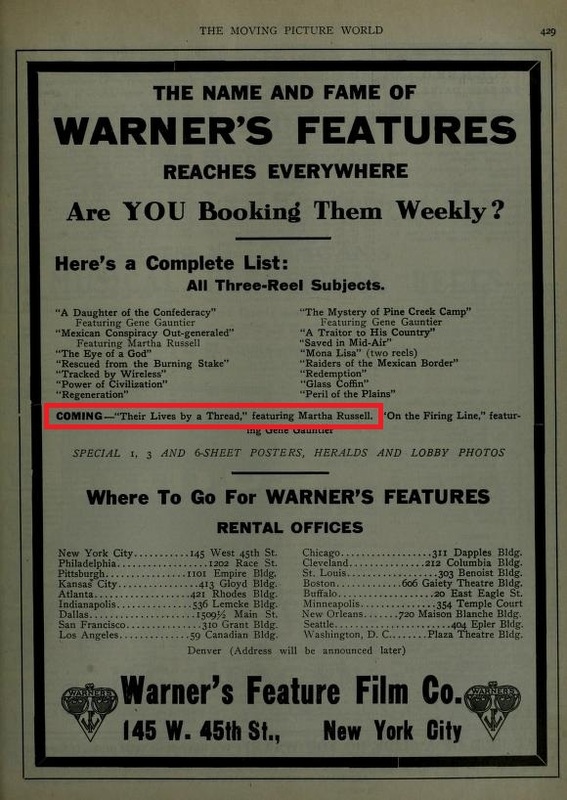 Distribución: Warner’s Features, Incorporated. Estrenada en abril de 1913. Drama. Intérpretes: Martha Russell y Robert Kelly.